Alpine skiing and snowboarding are great ways to spend time in the mountains relatively safely during the most unforgiving season of the year. In order to be able to offer this, ski resorts rely on a complex and energy-demanding infrastructure, with scores of employees and heavy use of water. The environmental costs associated with resort skiing come in multiple dimensions, and so do the solutions. Alpine habitats above the tree line are already threatened by global climate change, and disturbance from skiers is one more stressor. These disturbances can come from scaring wildlife or harming their habitat by damaging vegetation and compacting soils. Ptarmigan (a type of grouse adapted to snowy habitats) in Scottish ski areas declined over several decades from collisions with lift cables and other wires, and from losing nests to crows, which had become common at the resorts. In North American ski resorts, most of the skiable terrain is located in forested areas, requiring a large amount of clear-cutting to create ski trails. The resulting fragmented landscape negatively impacts habitat quality for many bird and mammal species. One study revealed that in the forest remnants left between slopes, bird diversity is reduced due to a negative edge effect. There, wind, light, and disturbance levels increase near the open slopes, reducing habitat quality. A recent expansion of a ski resort in Breckenridge, Colorado, prompted concerns that it would damage Canada lynx habitat. A deal with a local conservation group was achieved when the developer invested in lynx habitat protection elsewhere in the region. As a result of global climate change, most ski areas experience winters of increasingly shorter duration, with more frequent thawing periods. 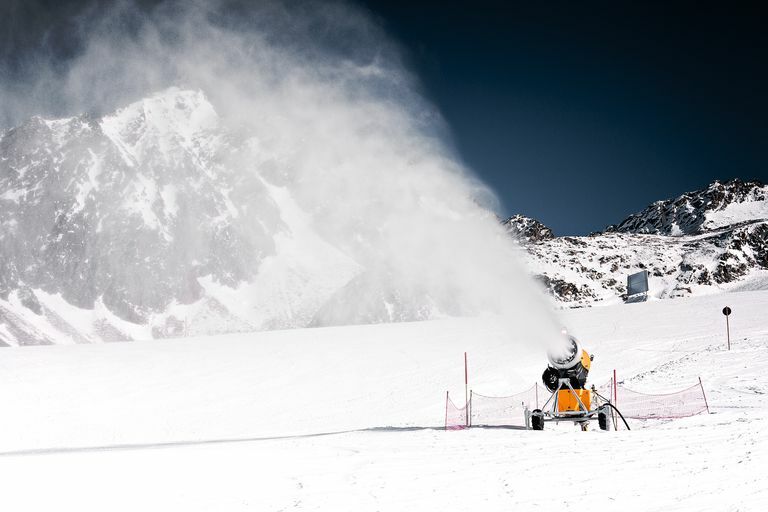 To maintain services to their clients, ski areas must make artificial snow to have good coverage on the slopes as well as around the lift bases and lodges. Artificial snow is made by mixing large volumes of water and high-pressure air. The demands for water can be very high, requiring pumping from surrounding lakes, rivers, or purpose-built artificial ponds. Modern snowmaking equipment can easily require 100 gallons of water per minute for each snow gun, and resorts can have dozens or even hundreds in operation. At Wachusett Mountain Ski Area, a modest-size resort in Massachusetts, snowmaking can pull as much as 4,200 gallons of water a minute. Resort skiing is an energy-intensive operation, relying on fossil fuels, producing greenhouse gases, and contributing to global warming. Ski lifts usually run on electricity, and operating a single ski lift for a month requires about the same energy needed to power 3.8 households for a year. To maintain the surface of the snow on the ski runs, a resort deploys nightly a fleet of trail groomers each operating on about 5 gallons of diesel per hour and producing carbon dioxide, nitrogen oxides, and particulate emissions. A complete estimate of the greenhouse gases emitted in association with resort skiing would need to include those produced by skiers driving or flying to the mountains. Ironically, climate change is affecting most ski regions. As global atmospheric temperatures go up, snowpacks are thinning, and the ski seasons are getting shorter. Many ski resorts have made substantial efforts to minimize their environmental impacts. Solar panels, wind turbines, and small hydro turbines have been deployed to supply renewable energy. Improved waste management and composting programs have been implemented, and green building technologies have been employed. Forest management efforts have been planned to improve wildlife habitat. It is now possible for skiers to gather information about a resort’s sustainability efforts and make informed consumer decisions. Where to start? The National Ski Area Association gives out yearly awards to the resorts with outstanding environmental performances. Alternatively, Nordic (or cross-country) skiing provides opportunities to enjoy the snow with a much lighter impact on land and water resources. Some Nordic skiing resorts do, however, make use of snowmaking technology and fossil-fueled powered trail grooming equipment. An increasing number of outdoor enthusiasts seek snowy slopes by practicing lower-impact forms of skiing. These backcountry skiers and snowboarders use specialized equipment that allows them to make their way up the mountain on their own power, and then to ski down natural terrain that has not been logged or groomed. These skiers have to be self-sufficient and able to mitigate a multitude of mountain-related safety risks. The learning curve is steep, but backcountry skiing has a lighter environmental impact than resort skiing. Alpine areas are very sensitive, though, and no activity there is impact free: a study in the Alps found that black grouse showed elevated stress levels when frequently disturbed by backcountry skiers and snowboarders, with direct consequences on reproduction and survival. Alettaz et al. 2007. Spreading Free-riding Snow Sports Represent a Novel Serious Threat for Wildlife. Laiolo and Rolando. 2005. Forest Bird Diversity and Ski Runs: A Case of Negative Edge Effect. MNN. 2014. Snowmakers Are Saving Ski Resorts…For Now. Wipf et al. 2005. Effects of Ski Piste Preparation on Alpine Vegetation. What's Your Favorite Ski Lift Type?